Read the following stories and answer the questions on the right, using Complete Sentences. 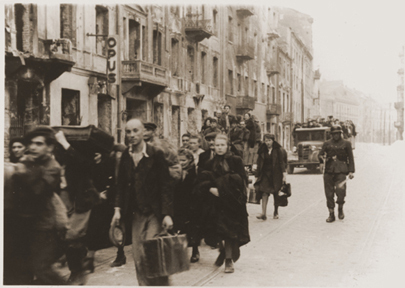 In December 1941, when I was 17, the Germans turned Losice, the Polish town where I lived with my parents and younger brother Israel, into a ghetto. The overcrowding was unbearable. We couldn't go out to buy wood or coal, and there was no medicine. Any Jew caught outside was killed. Three months later, I was taken to a labour camp 30 miles away. We had very little food and slept in unheated barracks. We got sick with colds, fevers, sores and lice. After 23 days, I escaped with a friend, Michael Rak. We hid in a barn during the day and at night we made our way home. The Jewish police came for me, but I was in hiding, so they arrested my mother. My father was afraid I would be killed, so he went in my place. In August the following year, the Germans surrounded the ghetto. We had to assemble in the square. There were wagons waiting. They told the women and children to climb on board and made the rest of us line up in rows. It was chaos. The SS took some people off the wagons and shot them. When the wagons left, they told us to start marching. They were shooting at us to make us go faster. I saw my mother following one of the wagons; I never saw her again. We reached a freight rail station on Sunday. Everybody was begging for water. Some people were screaming, so they killed them. On Monday morning, a train arrived and they pushed us into the cattle cars. Israel and I stationed ourselves near an air vent but the car quickly filled up and people were fainting. We realized we would die and reacted in the only way possible: we pushed ourselves up on other people's heads and managed to get out. I don't know how. The SS realized they couldn't push more people in, so they added more cars. My brother and I were in one of them. The train stopped after about three hours. 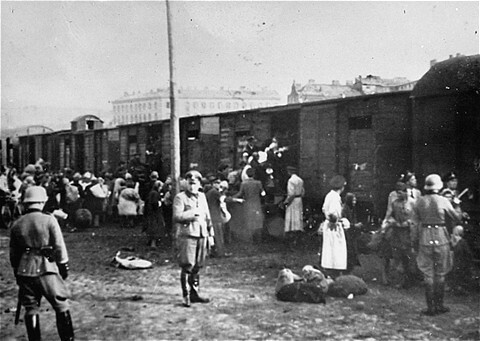 The name of the station was Treblinka. We knew this was our final destination, but we could never have imagined what they would do to us there. We could see a water pump, and people were breaking open the little windows and jumping, trying to get water. Every one was shot. They were sorting people and taking them to a large building. We had no idea what it was or why hardly anyone was coming out. We didn't know they were being gassed. They told us to pull the dead bodies out of the cattle cars. We worked all night. 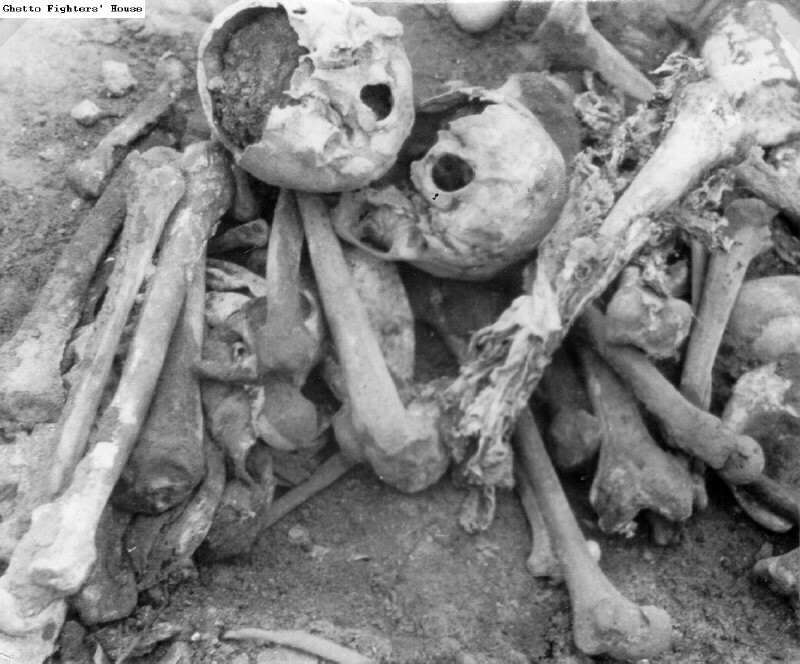 By morning, there was no more room for the dead, so they dug three large pits. I was queueing (standing on line) to get water when one of the SS men shot me. My knees buckled and I collapsed in a puddle of blood. The bullet went right through me, four inches from my underarm. Israel cleaned me up but I was begging him to call the SS man to finish me off. He hid me among the packages in the building where the clothes were kept. He said he was going to get water, but he never came back. He was 16. I don't even have a photograph of him. After three days, I sneaked out. I couldn't move my hand, but the injury wasn't permanent. Seven boys from my town were still alive and I joined their group, sorting clothes. The things I saw still haunt me. A dozen infants waiting next to a pit of burning bodies while the SS man went for his lunch. A woman who was too sick to stand being taken to the "hospital". The hospital was a big pit, where all the rubbish was on fire. The sick and wounded were taken there, shot and thrown in. On September 10, an empty train arrived. One of the boys loading it, Lejzer Mordsky, was from my town. He let me in, along with my friend Gedale Rosenzwejg and another boy from Losice, Michael Fishman. They buried us in a pile of coats, then stuffed the carriage with more clothing. The SS checked the train was full, locked the doors and left. About 20 miles down the road, we broke the windows and jumped. Somehow we got back to our town, where they had made a second ghetto. Nobody believed us when we told them what was happening in Treblinka. My father escaped from the labour camp two weeks later, and we went into hiding. I joined the Polish army after the Russians liberated us; in January 1945 I was on the frontline. Fewer than 100 survived Treblinka. I am the last one. The will to live is stronger than anything else; I never gave up. Maybe I'm meant to be alive to tell the story. This is the last generation to hear first-hand from survivors. In 10 years, there won't be any of us left. People should know what happened to us. One night after dinner with friends, I stopped at my studio and noticed Philippe's car parked outside. Thinking that was a bit odd, I went in. The door to the private lesson room was shut. As I called his name, Philippe opened the door – he was with one of his young students. I was furious. Philippe begged for forgiveness, and told me he loved me and that he'd slipped up. Stupidly, I believed him. While they began investigating, Susan and I took matters into our own hands, setting up surveillance across the road from his house. We took down license plate numbers and tracked down more than 23 women to warn them. Twelve had HIV.